This is the story of a man and woman whose paths in life started out in completely different directions and from completely different places, but who came together through chance and a hunger for adventure. Lesley Spencer was the actress Lesley Brook who appeared in many popular plays and films in the 1930s and 1940s. Terence Spencer was a fighter pilot in WWII, and then became a world renowned photographer. After 1945 Terence became innocently involved in flying illicit diamonds in South Africa. It was here he met his future wife, Lesley. Together, in a single engined aircraft and without radio, they flew 8000 miles back to England to be married. Months later, with Lesley pregnant, they flew back to South Africa in the same precarious way and bought a small farm. Lesley had exchanged the bright lights for paraffin lamps, bringing up her family in primitive conditions, while Terence developed his aerial photography business. Through a series of accidents and seized opportunities, he eventually became a photojournalist for LIFE magazine, covering wars, revolutions, disturbances and political crises around the world. Both Lesley and Terence have kept detailed diaries recording their lives and their experiences; this book brings out some of the key episodes and highlights from their memory banks. As you share their journey through these pages, you can read about the lowest successful parachute jump ever (Terence is still in the Guinness Book of Records for this achievement), life in South Africa under apartheid, the Congo revolution (one of the most unpleasant assignments ever undertaken by journalists), catching whales off the Azores, adventures with the British army in Aden and the US forces in Vietnam, travels with the Beatles, nature conservation in Rhodesia, tarantulas in South Africa and the difficulties of photographing such celebrities as Rex Harrison, Nureyev and Ava Gardner. You will not be bored for a moment as, like Lesley and Terence, you hurtle headlong from one excitement to the next. LIVING DANGEROUSLY could not be a better title for this story of two intertwined and remarkable lives. 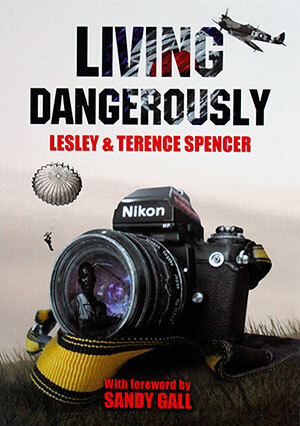 To buy “Living Dangerously”, the autobiography co-written by Terence and his wife Lesley, please contact Cara Spencer direct via email or call +44 (0)1202 249222.